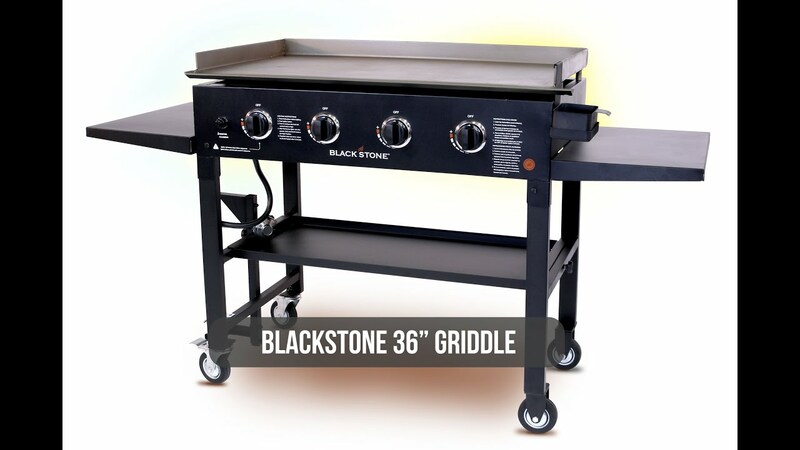 The Blackstone 4 Burner 36” Gas Griddle in Stainless Steel is the master of outdoor cooking. 4 independent heat controls and a scorching 60,000 BTUs for truly epic. Serve up an entire crowd with full-seared restaurant-quality steaks, flip up to 28 burgers or 72 hot dogs! Serve any size party with a Blackstone. Cook anything, anytime, anywhere! Breakfast, lunch, and dinner! 36" Blackstone Stainless Steel GrillLOVE IT!! Cooking all sorts of stuff is so easy on this grill. No more dirtying 3-4 pans in the kitchen. Yes the grease drain is in the front, but if you are careful it is not an issue. It comes pretty much pre assembled. Took about 15 minutes and most of that time was getting it out of the box. Was up and seasoning in no time. Just a guestionDo you sell the stainless steal top that I can buy to replace my fast iron one, getting tired of the dust that keeps coming back. Thanks for the review. We tested a stainless steel top for several months and did not like it at all compared to the cold-rolled steel top we currently use. On the stainless, everything stuck, it did not disburse the heat evenly and it was incredibly difficult to clean. what grade of stainless steel is used.Was wondering what grade of stainless steel was used in the units. 304 , 440 for example. Our Stainless unit is 304 Stainless Steel. Stainless model comes with the old front grease trap top...why?? ?Why does your premier/most expensive model still have the old front grease trap top??? I 100% do not remember seeing the **PLEASE NOTE** warning when I bought it as I researched this thing for hours and assumed by all the newer comments that it would come with the newer top. Was this note just recently implemented? I also left a note in my order that I wanted the new rear grease trap top, and for them to contact me if that was not the case as I wasn't sure after reading a lot of comments. So I thought if I order from Blackstone direct, I would get the newest. I was never contacted. I will most likely be returning it. I can't stomach paying for the most expensive model knowing that the cheaper ones have a better grill top...doesn't make any sense at all. I am sorry that you misunderstood. We should have rear grease units of Stainless available in the next couple months. A little tweakingGrill works great saves a ton of dishes at the cabin first thing I did was put a nail in grease hole for drainage into bucket then I went on amazon and purchased a spout like thing that slides over end works awesome like 15$ Searched black stone accessories I see now you can buy a key I guess the spout will work better I do wonder why my black model has the front grease drain because it’s older but my new stainless still has the front drain not the back and the top is kinda textured like not smooth I also have the little one for camping they are very handy and durable. To answer your inquiry in this review, we had purchased a significant quantity of Stainless Steel units because of the high demand for them PRIOR to the new rear grease management system coming out. We will order more Stainless units that have it very soon.